Scientific Practices in European History, 1200–1800 presents and situates a collection of extracts from both widely known texts by such figures as Copernicus, Newton, and Lavoisier, and lesser known but significant items, all chosen to provide a perspective on topics in social, cultural and intellectual history and to illuminate the concerns of the early modern period. The selection of extracts highlights the emerging technical preoccupations of this period, while the accompanying introductions and annotations make these occasionally complex works accessible to students and non-specialists. The book follows a largely chronological sequence and helps to locate scientific ideas and practices within broader European history. 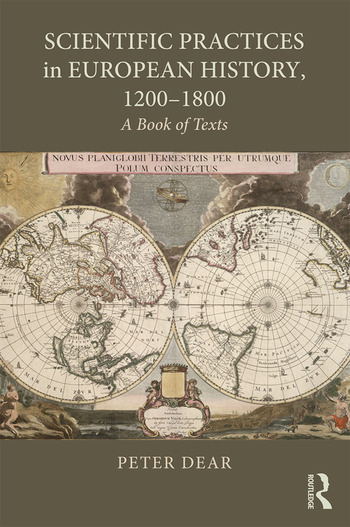 The primary source materials in this collection stand alone as texts in themselves, but in illustrating the scientific components of early modern societies they also make this book ideal for teachers and students of European history. Petrus Peregrinus, On the Magnet, trans. Brother Arnold (New York: McGraw, 1904). Public domain. Part I, chaps. 1-10; Part II, chap. 3. Thomas Aquinas, "Disputed Questions Concerning the Power of God, Trans. the English Dominican Fathers (Westminster, MD: Newman Press, 1952 ). Public Domain. Q. VI: Article I (selections). Sacrobosco, De sphaera, trans. Lynn Thorndike (Chicago: University of Chicago Press, 1949). Open access. Chaps. 1-4 (pp.118-123). Nicolaus Copernicus, De revolutionibus orbium coelestium ("On the Revolutions of the Celestial Spheres"), Preface, slightly modified translation from Charles W. White (ed. ), Prefaces and Prologues to Famous Books, Harvard Classics vol. 39 (New York: P. F. Collier, 1910), pp. 52-57. Jose de Acosta, Natural and Moral History of the Indies [De Orbe Novo], trans. 1604 (Biodiversity library, an 1880 edition); some additional paragraphing added. William Gilbert, De magnete , trans. Sylvanus P. Thompson (London: Chiswick Press, 1900): most of Edward Wright’s preface, and Bk.6, chap.1 (very slightly adjusted). Galileo, Sidereus nuncius (1610), translated Edward Stafford Carlos (1880), revised by Peter Barker, Byzantium Press, 2004. Extracts reproduced by permission of copyright holder. Preface, and pp. 5r-6v, 11r-13r, 28r-28v. Francis Bacon, Sylva sylvarum (London, 1626), paras.14-16, 143-153, 326, 328, 795, 812-815, 886, 998. Galileo Galilei, Discourses and Demonstrations Concerning Two New Sciences (Italian, with Latin passages, 1638; English trans. by Henry Crew and Alfonso de Salvio, 1914), extracts from Second Day (pp. 109-117). William Lilly, Christian Astrology (London, 1647), extracts from "To the Reader." Robert Hooke, Micrographia (London, 1665); the preface (with small omissions). [Robert Boyle] "General Heads for a Natural History of a Countrey, Great or small, imparted likewise by Mr. Boyle." Philosophical Transactions 1 (1665-66), pp. 186-189. [Isaac Newton] "A Letter of Mr. Isaac Newton ... containing his New Theory about Light and Colours,"　Philosophical Transactions　(No. 80, February 19, 1671/72), pp. 3075-3079 (extract). William Petty, Another Essay in Political Arithmetick (London, 1682), pp. 3-22. Edmond Halley, "An Historical Account of the Trade Winds, and Monsoons, observable in the Seas between and near the Tropicks, with an attempt to assign the Phisical cause of the said Winds," Philosophical Transactions 16 (1686 - 1692), pp. 153-168. C.-F. Dufay, "First memoir on electricity," Mem. de l’Academ. R des Sc., 1733, extracts from pp. 23-35; "Fourth memoir on electricity" (extract, pp. 457- 459). Trans. by Peter Dear. Georges-Louis Leclerc, comte de Buffon, Histoire naturelle, vol.1 (1749), pp. 49-55. Trans. by Peter Dear. Barthélemy Faujas de Saint-Fond, Première suite de la description des expériences aérostatiques (Paris, 1784), pp. 44-47. Trans. by Peter Dear. "Sur la formation et la decomposition de l’eau," Histoire de l’Académie Royale des Sciences, 1781 (Paris, 1784), pp. 21-25: "On the Formation and Decomposition of Water," trans. by Peter Dear. Antoine Lavoisier, Preface to Elements of Chemistry, pp. xiii-xxxvii , translated by Robert Kerr, 1790. Alessandro Volta, Phil. Trans. 1800 Pt.II, dated 20th March, 1800; read to the Royal Society 26th June, 1800, pp. 403-409). English translation in The Philosophical Magazine, Sept. 1800, pp. 289-311. William Jones (from The Works of Sir William Jones, 1807, vol. 3, pp. 185-204), Ninth Anniversary Discourse to the Asiatick Society, Calcutta. William Murdoch, "An Account of the Application of the Gas from Coal to Economical Purposes," Philosophical Transactions 98 (1808) pp. 124-132 (extracts). Thomas Malthus, An Essay on the Principle of Population (London, 1798), extracts from chap. 1. Peter Dear is Professor of the History of Science at Cornell University, USA. His previous publications include Revolutionizing the Sciences: European Knowledge and Its Ambitions, 1500-1700 (2009), The Intelligibility of Nature: How Science Makes Sense of the World (2006), and Discipline and Experience: The Mathematical Way in the Scientific Revolution (1995).